Near-infrared optical projection tomography enables the visualization of several cell types in large preparations. 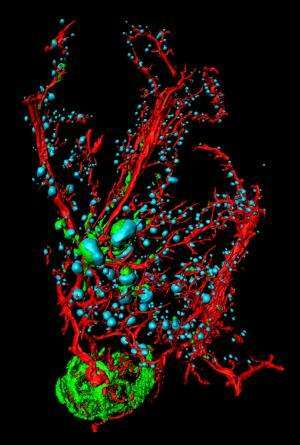 The image of a pancreas from a mouse with type-1 diabetes shows the insulin-producing islets of Langerhans in blue, blood vessels in red, and infiltrating autoimmune cells that break down the insulin-producing cells in green. A new imaging method for the study of insulin-producing cells in diabetes among other uses is now being presented by a group of researchers at Umeå University in Sweden in the form of a video in the biomedical video journal, The Journal of Visualized Experiments. The developed techniques have contributed to the reasons why the research team recently received a SEK 4.3 million grant from the EU in a Marie Curie program to link together leading research teams in Europe in the field of diabetes imaging. Professor Ulf Ahlgren and his associates at the Umeå Center for Molecular Medicine (UCMM) have subsequently elaborated the technology for biomedical imaging with optical projection tomography (OPT). Initially the method could only be used on relatively small preparations, but five years ago the scientists at Umeå were able to adapt the technology to study whole organs including the pancreas from adult mice. The present findings describe a further development of the OPT technology by going from ordinary visible light to the near-infrared spectrum. Near infrared light is light with longer wavelengths that can more easily penetrate tissue. Thereby, the developed imaging platform enables studies of considerably larger samples than was previously possible. This includes the rat pancreas, which is important because rats as laboratory animals are thought to be physiologically more similar to humans. Near-infrared optical projection tomography enables the visualization of considerably larger preparations than were previously possible with OPT. 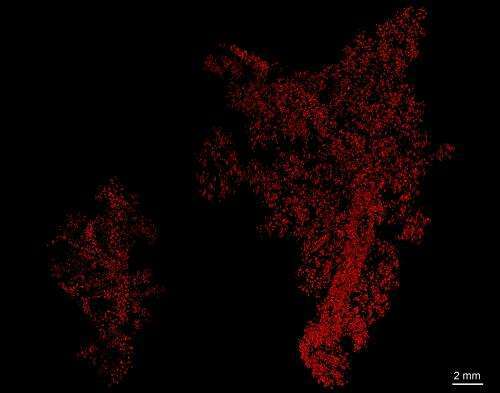 The image shows the insulin-producing islets of Langerhans (red) in a mouse pancreas (left) in relation to those in a rat pancreas (right). The pancreas of a rat is 5-6 times larger than that of a mouse. This adaptation, to be able to also image in near-infrared light, also means that the researchers gain access to a broader range of the light spectrum, making it possible to study more and different cell types in one organ preparation. In the article the scientists exemplify the possibility of simultaneously tracking the insulin-producing islets of Langerhans as well as the autoimmune infiltrating cells and the distribution of blood vessels in a model system for type-1 diabetes. Internationally, huge resources are being committed to the development of non-invasive imaging methods for study of the number of remaining insulin cells in patients with developing diabetes. Such methods would be of great importance as only indirect methods for this exist today. However, a major problem in these research undertakings is to find suitable contrast agents that specifically bind to the insulin producing cells of the pancreas to allow imaging. In this context, the developed Near Infrared - OPT technology can play an important role as it enables the evaluation of new contrast agents. It may also be used as a tool to calibrate the non-invasive read out by e.g. magnetic resonance imaging (MRI). This is now going to be tested in the newly launched Marie Curie project "European Training Network for Excellence in Molecular Imaging in Diabetes," which links together five major EU-funded research consortia with different cutting-edge competences in the field. The enhanced technology allows new types of analyses, such as the possibility of evaluating preclinical samples for the purpose of developing better strategies for transplanting islets of Langerhans in diabetics. The image shows a liver from a mouse (gray) into which islets of Langerhans (blue) have been transplanted. 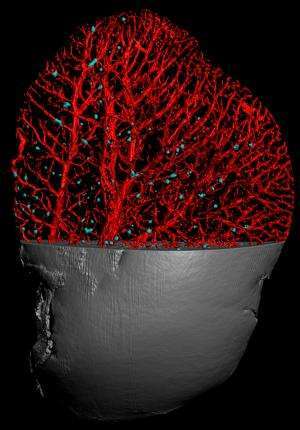 By visualizing several markers in an organ it is possible to see directly where the islets of Langerhans wind up in the blood vessel tree. The study by scientists from Umeå is presented in the Journal of Visualized Experiments, which is the first scientific journal to offer the video format for publication in the life sciences. Visualization in video presentations clearly facilitates the understanding and description of complex experimental technologies. It can help address two major challenges facing bioscience research: the low transparency and poor reproducibility of biological experiments and the large amounts of time and work needed to learn new experimental technologies. More information: Link to the video article.